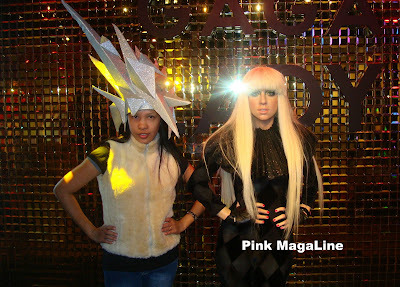 Pink MagaLine: I Met Lady Gaga in Hong Kong! I did not see Lady Gaga when she went to the Philippines for her concert in 2009, so I was very happy when I finally met her in Hong Kong. Yeah.. not in flesh though, but in wax! Hahaha. After looking around at The Peak last Thursday, we also visited Madame Tussauds. There were lots of iconic people there including Lady Gaga herself. Look, I looked almost as tall as her after wearing the silver spiky hat. omg!!!! i want to meet her too..
kala ko talagang meet and greet! Shopping spree ha! ang cute mo sis sa picture, walang binatbat si lady gaga! where did you stay in HK? hahahaha, akala ko totoo na..ang gara ng hat.